I prefer to make selfbows from Osage orange (Maclura pomifera) but can make them from other woods as desired. I like to shoot a 62" - 68" selfbow at my normal hunting weight all year long. I feel this allows me to be a little more consistent in my shooting. I will make the bow to your specifications. All selfbows come with a new Flemish twist string. I normally prefer to add a bison horn tip arrow shelf but can use wood or other materials as desired. I make selfbows as long or short and as heavy or light as is desired and is feasible. I can make you a 5# bow, and I can make you a 75# bow. Many of my bows have what people often refer to as "character." This may be a hole through the wood, a snaky limb, undulations, or knots. All bows are guaranteed to be shooters. 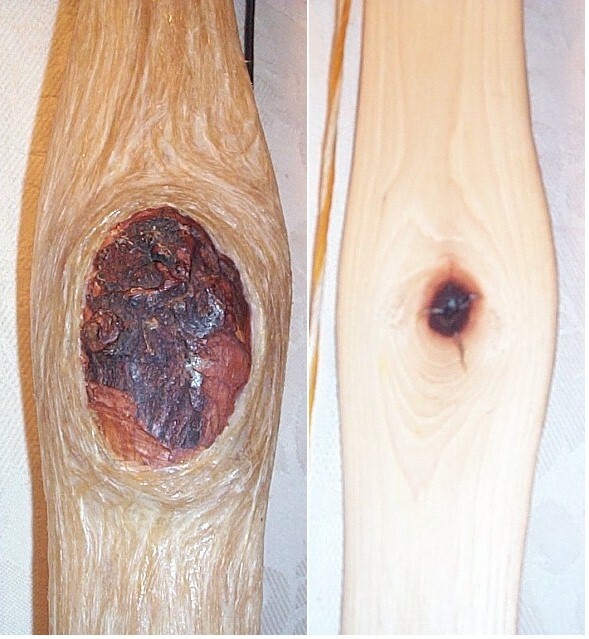 Imperfections in the wood are actually well compensated for in the natural growth of the tree. Alternative Woods (check for availability): yew, red mulberry, sassafras, hickory, maple, ironwood, and Eastern red cedar. I use elk or deer leg sinew to back some bows. Sinew-backed bows are shorter in length and more durable. All sinew-backed bows normally come with a bison horn tip arrow shelf. The guy that bought this bow took a deer with it. Bows like this are real weapons, not toys. A snakeskin backing is a good way to help waterproof a sinew backing, and it adds a nice primitive look to the bow. Some people also consider it to be nice natural camouflage and like to add it to a selfbow. I can use bison horn tips for limb tip overlays on all bows I make. They are affixed with hide glue and tied down with sinew. These overlays are really just for aesthetic appeal; they serve no real function on my bows.